Cosmetic dental care such as teeth whitening can substantially improve the brightness and whiteness of your teeth. This is not a permanent solution and requires “touch-ups” for a prolonged effect, however is one of the fastest and easiest ways to improve the appearance of your smile. All whitening requires a pre-assessment to ensure that you get the right care and are well informed. Your teeth and gums will be assessed to determine your suitability for whitening. This includes identification of any pre-existing fillings etc. that will need replacement as part of achieving the appearance you are after. Then impressions (moulds) will be made of your teeth to fabricate custom, clear plastic, trays. If you have opted for take-home whitening you will be given clear instructions with your take-home kit to effectively and safely manage your whitening at home. 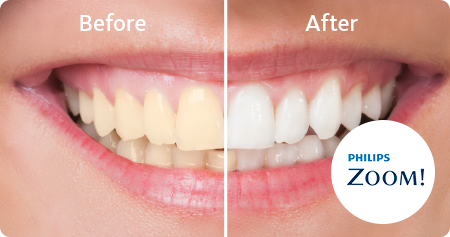 For In-house whitening (Zoom) most results are achieved within a 1hr 20min session but some results require more. You are provided with a self-care maintenance kit for touch-ups at home. For both you may experience some tooth sensitivity during the time you are whitening your teeth – this is normal, and will subside shortly after you have stopped bleaching. We provide sensitive care toothpaste and recommend use of a remineralising gel (Tooth Mousse) to increase post-whitening comfort.